← Ice-T didn’t shoot ME in the face, but maybe some other person? 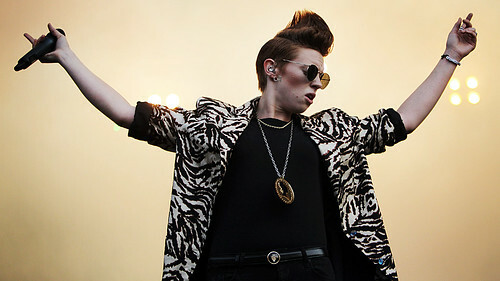 ’80s synth-revivalists La Roux claim ’80s revivalism is “so over”. The San Francisco Film Society’s screening of 1919 silent film Sir Arne’s Treasure on December 14 will be accompanied by an original score by The Mountain Goats, performed live. Pitchfork has a good list of streamable content up right now, including: Caribou’s Swan Remixes, chillwave band Small Black’s New Chain, and more. Too many songs for an EP, not enough for an LP? Try releasing a 3P! Try instead, every 3 months, to record and release a new 3P, a 3-song collection of somewhat similar tunes! I first heard this term used by the folks at NewRockstarPhilosophy.com and it perfectly described something I’m trying right now in my own music career. It’s almost Halloween — AUX is here to help you out if you’re still looking for a costume. I wonder where they found that pic of Nick Cave smiling?